It’s a February night and you’ve got the porch light on. It’s 37 degrees out, but there, fluttering around the lamp, is a moth. Moths in winter are not freaks of nature. In North America, at least 50 species may appear throughout the winter – as long as the temperature is above freezing. Specially adapted to cold weather, they have furry bodies and circulation systems designed to retain heat while keeping flight muscles flexible and functioning. Many dine on tree sap, high in sugar and energy content, and they shiver to warm up. When the temperature dips too low, they can tuck themselves under some leaves and nod off till the next thaw. 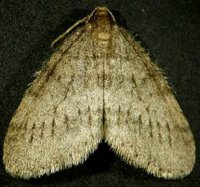 Why should moths bother to adapt to an environment so hostile to a cold-blooded creature? In many ways, winter is less hostile than summer. There are no night-flying bats or birds to gobble them up; the bats are hibernating and birds are down south. For some creatures, there’s safety in camouflage; for others, safety in numbers. But for wintertime moths, it’s safety in shivering.